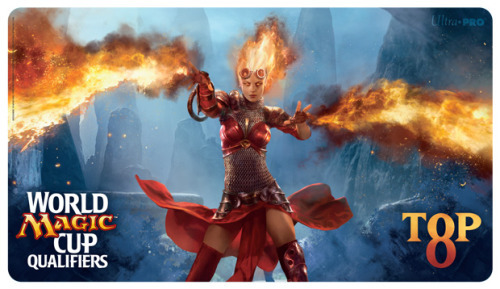 Today, being Thursday, what a most appropriate time to catch up with our sister site, MTG Realm on Tumblr and see what they've been up too this past week. Now on R-TV - The Gruul Bunch, a sit-com featuring the Rubblebelt’s most beloved dysfunctional family, the Utvarans. It’s nearly impossible to keep on the shelves. World Magic Cup Qualifiers will be run the weekends of April 6–7, April 20–21, and June 1–2, 2013 in seventy-one countries. 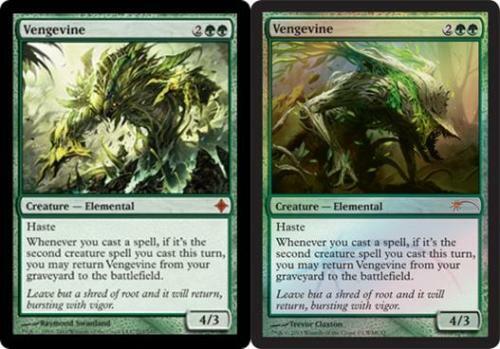 an alternate-art Vengevine will be given to all participants (while supplies last) and Top 8 players will earn an exclusive World Magic Cup Qualifier Top 8 playmat. Vengevine, Rise of the Eldrazi Mythic Rare - Original card art illustrated by Raymond Swanland, Promo card art by Trevor Claxton. Fodder for Dragon’s Maze speculation ! - Guild Champions ! Heroes World - Markham Town Square Plaza, Markham, Ontario, Canada-Land. 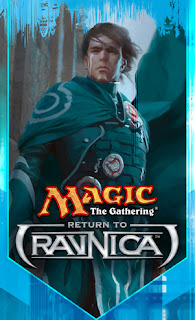 This is post number two of two (first one here) of our exploration of Doug Beyer's book series 'The Secretist' which provides Wizard of the Coast's literary back-drop to Magic: the Gathering's Return to Ravnica set. Previously, WotC had published paperbacks to accompany select sets but have moved this to eBooks in keeping with the times. The first book, 'Return to Ravnica: The Secretist, Part One' sets the stage for a re-introduction of the plane of Ravnica and provides some components which resulted in printed cards found in the first set of the Return to Ravnica block. In this post we'll loook at 'Gatecrash: The Secretist, Part Two'. Buy your eBooks online - these are significantly less expensive than previous paper copies, and you don't even require a eReader as you can read within a browser. If you are like us here at MTG Realm, you will likely not only want to bathe in the flavour of the story line but have the actual game card as well. Drop by MTG Mint Card to pick up Magic: the Gathering Singles from this set and others. When we last left our telepathic protagonist Jace, he had discovered a code inscribed in ancient stone in Ravnica's historic Tenth District. It points at something called the Implicit Maze, and as Jace delves deeper, he finds that this mystery connects to the mysterious project of the brilliant dragon Niv-Mizzet and the Izzet guild the dragon commands. 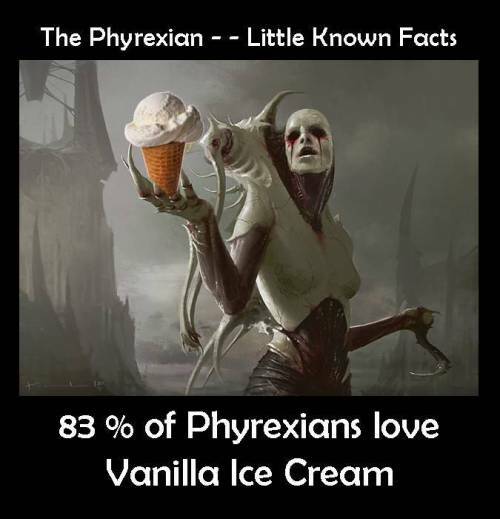 This information is so dangerous, so likely to warp the equilibrium of the ten guilds in this post-Guildpact world, that Jace has taken extreme steps to extricate himself from the whole matter. Here are some notes from 'Gatecrash: The Secretist, Part Two'. Read the eBook, and drop us a line in the comment thingy to discuss. Chapter 1 - A Wanted Mind Jace and Emmara are confronted of Mirko Vosk who discovers that Jace had purged his mind of his research. Niv-Mizzet has Ral Zareck switch gears on the Maze project. The demon Rakdos has the blood-wtich Exava initiate a riot. Isperia, the Sphinx guild leader of the Azorius reassigns Officer Lavinia to a desk job. The vampire Mirko Vosk is punished by the Dimir guild leader Lazav. Jace and Emmara meet Trostani, Jace makes no friends, especially with the Selesnya Elf Captain Calomir. Ral Zarek and Skreeg piece together Jace's investigation at his destroyed study. Chapter 4 - Aid from an Enemy The Rakdos, lead by Exava riot while Jace meets with Lavinia at New Prahv. Ral's search dead-ends at the Forum of Azor, seeds of suspicion are sewn within Emarra and Jace needs help from the two headed Ogre Ruric Thar. Selesnya prepares to march against the Rakdos, while Niv-Mizzet and Ral begin to understand the Implicit Maze. Rakdos, Gruul, Selesnya and Boros clash in the streets. Chapter 7 - Rough Crowds Jace is captured by Exava and then in turn by Captain Calomir while Niv-Mizzet makes an important announcement. Lazav reveals himself to Jace and promptly imprisons him. 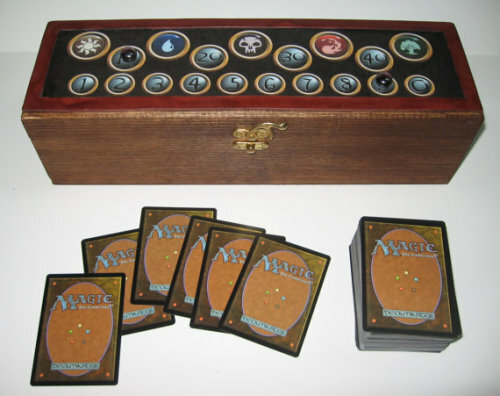 This is post number one of two (second one here) of our exploration of Doug Beyer's book series 'The Secretist' which provides Wizard of the Coast's literary back-drop to Magic: the Gathering's Return to Ravnica set. Previously, WotC had published paperbacks to accompany select sets but have moved this to eBooks in keeping with the times. The first book, 'Return to Ravnica: The Secretist, Part One' sets the stage for a re-introduction of the plane of Ravnica and provides some components which resulted in printed cards found in the first set of the Return to Ravnica block. Buy your eBooks online - these are significantly less expensive than previous paper copies, and you don't even require a eReader as you can read within a browser. If you are like us here at MTG Realm, you will likely not only want to bathe in the flavour of the story line but have the actual game card as well. 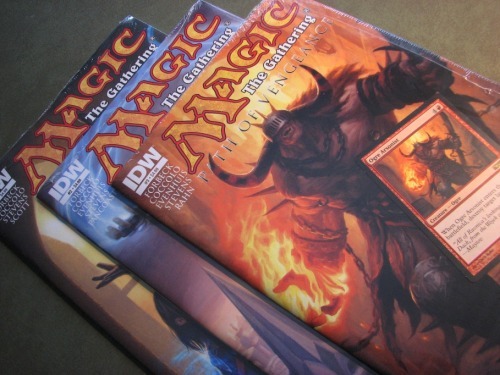 Drop by MTG Mint Card to pick up Magic: the Gathering Singles from this set and others. Summary: Jace Beleren has the power to travel between planes of the Multiverse, but with this gift comes isolation. He is one in a million. 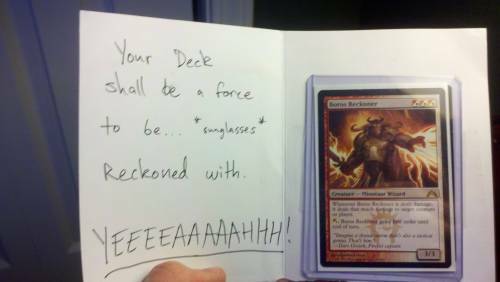 He is a planeswalker. And he is on the edge of a mystery that could alter the face of his adopted home—a vast, world-wide city known as Ravnica—forever. Faced with a magical code that is built into the very foundations of the city-world itself, Jace marches into the numinous depths of Ravnica’s underbelly in search of the promise of powerful magic. What he finds is perhaps more burden than boon. Once buried in past, the code resurfaces as Ravnica’s power-hungry mage guilds, unbound by the Guildpact that had once maintained order, struggle for control of the plane. But in the drive for primacy, there is no neutral ground. Jace knows that he can’t crack the code on his own, not while the guilds task teams of mages to unravel the mysteries, but he also knows that the danger of the quest is too great to include his friends. As the mystery begins to unravel, the choice may not be his alone. Here are some notes from 'Return to Ravnica: The Secretist, Part One'. Read the eBook, and drop us a line in the comment thingy to discuss. 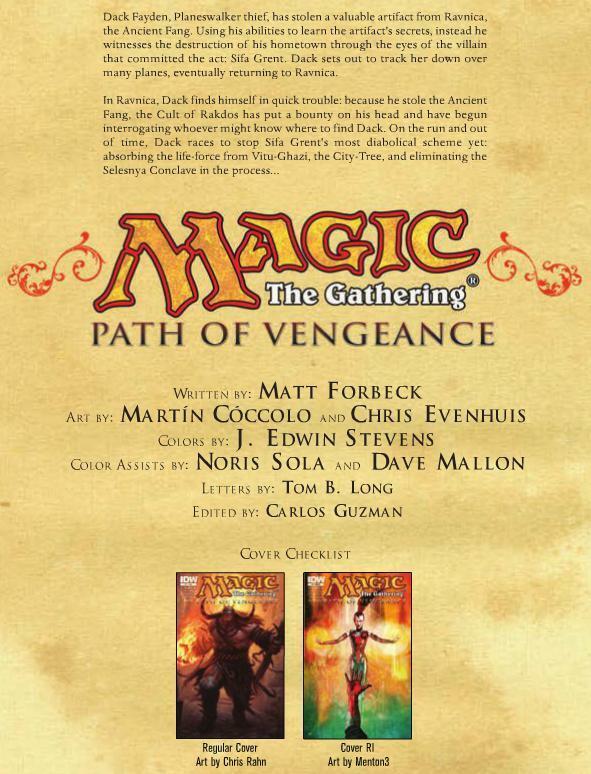 Chapter 1 - Knocking on Doors Our main character, the Planeswalker Jace Beleren is working within the Tenth District of Ravnica with the Vedalken Kavin. Toegether they are attempting to understand ancient runes and patterns found on stone work around the district - something that the Izzet Guild appears to be interested as well. This is confirmed when another young Planeswalker Ral Zarek, aligned with Izzet is introduced, along with his fav Izzet Goblin mage side-kick 'Skreeg'. There's a dust-up with the Golgari in the ancient tunnels as Ral is attempting to locate powerful leylines of old mana energry. Emmara, an Elf Healer re-connects with Jace and tries to persuade him to join the Selesnya Conclave but can't convince him. Mirko Vosk, presumably a Dimir Spy overhears all and reports back to his boss. Chapter 2 - Inside the Firemind Jace and Kavin make significant progress in their investigation. Niv-Mizzet and Trostani is introduced while the Dimir continue to plot. Jace feels that his new knowledge now places him in danger and wants to destroy his and his assistant's memories of their research. 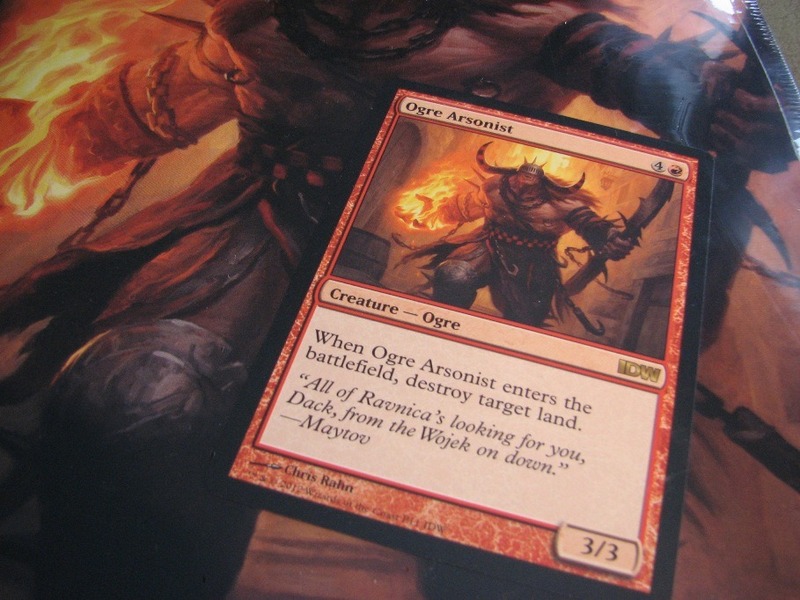 The Rakdos, Azorius and a Gruul Ogre all make plays to secure Jace or rather what he may know. Jace attempts to rescue the kidnapped Emmara from the Rakdos. 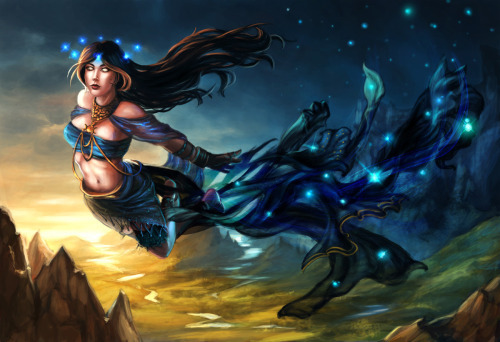 Exava, a Blood-Witch battles Jace. Possibly our favourite character in the book, a witty / sarcastic Viashino is provided a page or two here. Jace searches the depths for Emmara, while Ral makes no friends with the Azorious in his search for the leyline / mana-braid. Cliffhanger end as the vampire Mirko faces off against Jace and Emmara. 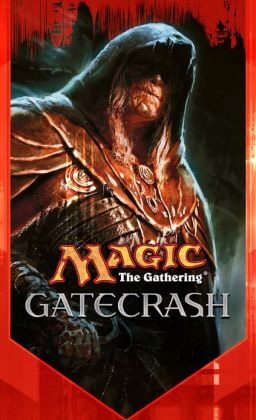 Stay tuned for part two when we dig into the newest MTG novel, 'Gatecrash: The Secretist, Part Two'. 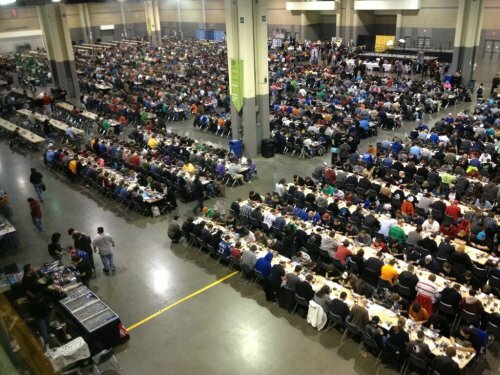 It was certainly a very busy weekend for Magic: the Gathering players. Not only was is Gatecrash Game Day, but there was also TWO Grand Prix events taking place. 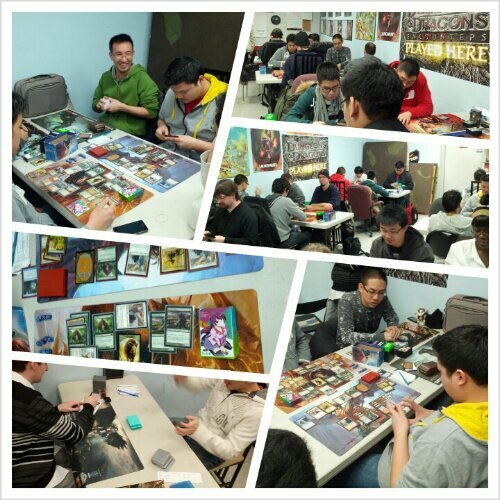 GP Charlotte (sealed format) broke records for being the largest-attended event to date with 2,692 players while here in Canada, GP Quebec (standard format) attracted 800 games who braved the cold weather to get down to gaming at the Centre des Congrès de Québec. We had a blast at Game Day at OMG! Games and were happy with our new cards we picked up at MTG Mint Card to complete our decks. We've been talking to other magic players for the last few weeks and we all agree that typically the standard format would have, within a few weeks after the newest set release, distilled to produce only a handful of decks which 'rules the roost' until the next release. As home-brew fans, we love that the format is as diverse as it is. Here is an excellent summary by WotC minion Josh Bennet posted to the mothersite describing the current metagame as it looked on day 2 in Ville de Québec. Grand Prix Québec attirant des centaines de joueurs de Magic qui se disputeront des prix et la gloire dans une ambiance de festival. If the health of a format is measured by the number of viable decks, it appears that Standard is is a very good place right now. Following the diverse Top 8 at Pro Tour Gatecrash and the breakout success of The Aristocrats, it was an open question how the metagame would shape itself. 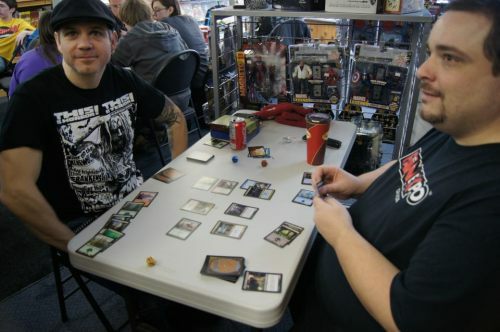 The Pros who stayed in Canada to battle this weekend agreed that, while they expected a lot of Jund, it was important to have game against a variety of deck types. Looking at the 128 players who crossed into Day 2, that intuition proved correct. Here's how it shakes out. Jund Midrange - 21This deck is stocked with haymakers: Rakdos's Return, Garruk, Primal Hunter, Huntmaster of the Fells, Thragtusk and Liliana of the Veil. Farseek and occasionally Arbor Elf help to speed the deck to its powerful plays, and Aburpt Decay and even Murder (remember Murder?) let it deal with the format's boogeyman, Boros Reckoner. The aggressive Sphinx's Revelation deck turns on the powerful four-card package of Boros Reckoner, Augur of Bolas, Restoration Angel and Snapcaster Mage. Those cards let it take a defensive posture against aggro decks, while going on the beatdown against the more dedicated control decks. Of all the decks in the field, it may be the only truly "Midrange" deck. "The Other Sphinx's Revelation Deck" plays pure control, but still with very little countermagic. Instead it relies on sweepers and spot removal, with Think Twice acting as a bridge to the format's defining card draw spell. Nephalia Drownyard gives the deck an inescapable win condition. Playing a much different game than its stockier brother, this deck harnesses the power of Burning-Tree Emissary and Flinthoof Boar for explosive starts, and touches black for Dreg Mangler, Abrupt Decay and Falkenrath Aristocrat. Centered around stocking the graveyard with humans then casting Unburial Rites on Angel of Glory's Rise, the newest version of this deck adds Undercity Informer and Burning-Tree Emissary to the mix for an instant mill kill. Not all of the Reanimator decks this weekend are wise to the tech. Straight from the Top 8 at Montreal, this deck is reminiscent of the first BantSphinx's Revelation decks, but now with better mana and access to the power of Kessig Wolf-Run. Thragtusk, Restoration Angel, Huntmaster of the Fells, acceleration, removal and often both Aurelia, the Warleader AND her Fury. 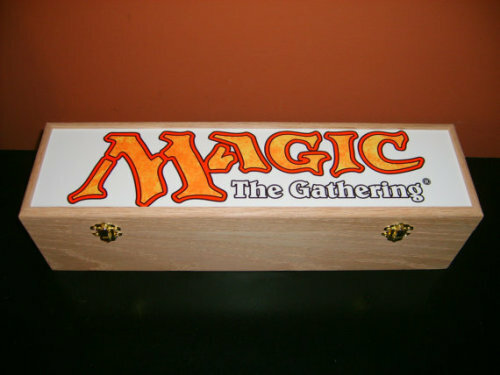 The deck that Tom Martell played to his Pro Tour victory. Designed by Sam Black, it is a tight package of synergies. The beatdown sensation from MTGO. Twelve one-drop humans, Lightning Mauler, Burning-Tree Emissary, Mayor of Avabruck, Frontline Medic. Surprise, you're dead. Both the land-light version with a "curve" that seems to stop at two, as Ben Stark played at Montreal, and a bigger version that goes up to Wolfir Silverheart and Increasing Savagery. The best creatures from Naya backed by Mizzium Mortars and Domri Rade. An update of the formerly-popular Red-Black zombies to include Lotleth Troll. 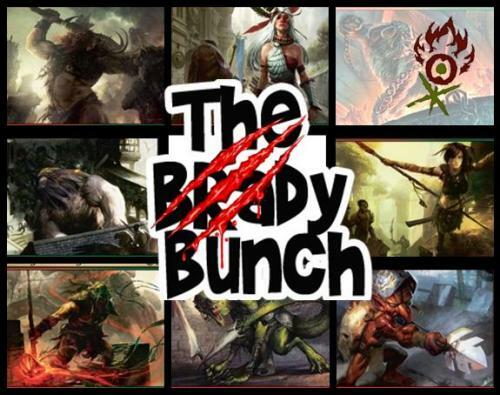 A take on Conley Woods's "Black by Popular Demand", Boros Beatdown, Black-Red Aggro, Dark Naya, Green-White, Junk Goodstuff, two takes on Junk Rites with Craterhoof Behemoth, Mono-Red, two takes on Orzhov Zombies, a Red-White-Black Planeswalker Control, Junk with Homicidal Seclusion, Token Reanimator, and Blue-White Humans. The weekend is quickly approaching - and - it just so happens to be Gatecrash Game Day ! If you are anywhere north of Toronto, take a short drive up to OMG! Games here in Barrie, Ontario. If you happen to be going to Georgian College, just walk across the street to the plaza on Bell Farm Road. 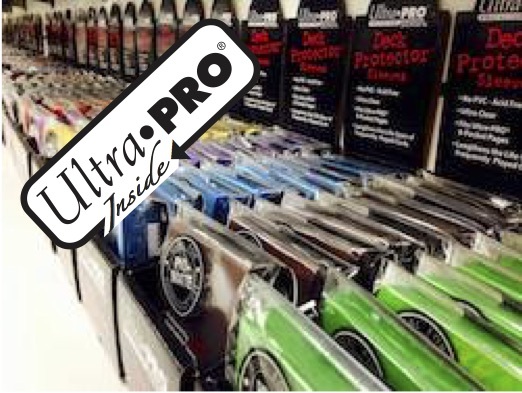 Bring along your standard constructed deck and get ready to game. Prizes: All players recieve a full art Zameck Guildmage. Top 8 players recieve a full art Firemane Avanger and boosters. Winner will also recieve a custom 'Champio' playmat. 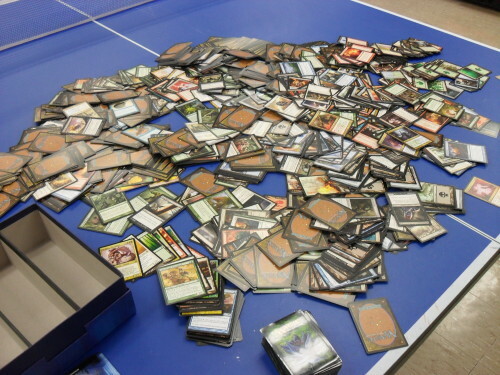 Anywhoos - onto today's juice, squeeze fresh for you from our sister site, MTG Realm on Tumblr where we strive to collect and post all the Magic: the Gathering miscellany around the inter•webz. Let's go . 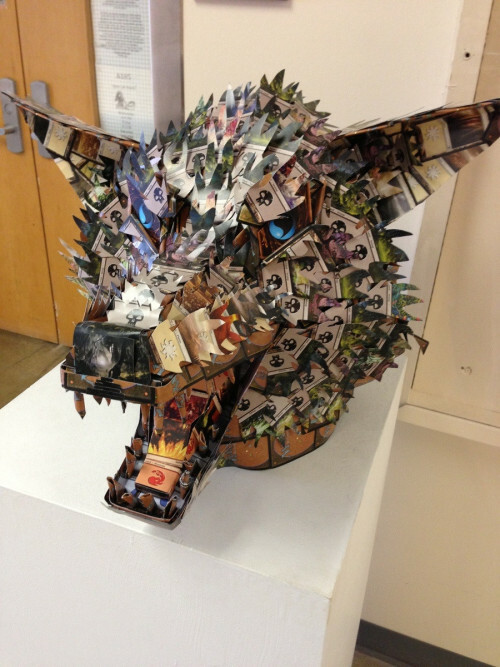 . .
Posted by Reddit User Packwhore - MTG card craft on display in his school’s art program hall. I am in awe - certainly the coolest thingy I’ve seen in a while. Reddit User freefire6 received this trade recently along with a witty CSI Miami / Horatia Cane quip. You know you have a MTG collection addiction when you NEED to have ALL the Return to Ravnica and Gatecrash Guild Leaders with their respective deckboxes. This one’s from MTG gamer WanderingWind. 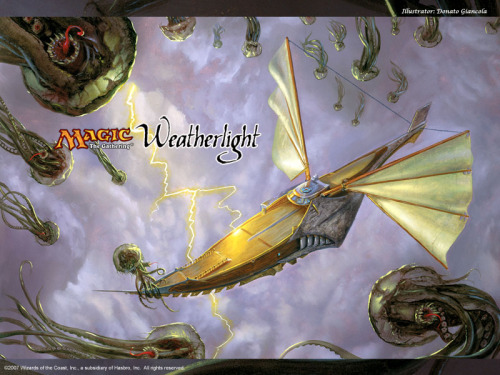 Weatherlight is the 11th Magic expansion, released in 1997 as the third set and second small expansion of the Mirage block. 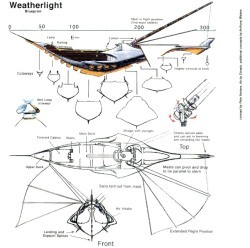 The Weatherlight skyship was a legendary ship capable of planeshifting and was designed by the Planeswalker Urza. Urza constructed the ship at the Tolarian Academy and had used Thran metal and Weatherseed wood from Yavimaya. 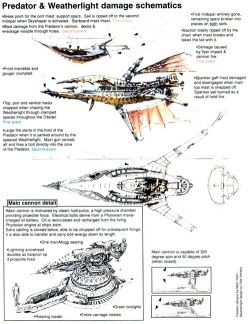 This vessel proved to be a critical part in the efforts to save Dominaria from the Phyrexian invaders although it’s first mission was to Serra’s Realm. During it’s mission to rescue Serran refugees from it’s Phyrexian takeover, Urza collapsed the plane into the Weatherlight’s powerstone core, giving it better punch than the Millenium falcon and setting the record for the Kessel run at ten parsecs. In Greek mythology, the Greek goddes Nyx was the personification of the night while Hemera was the personification of day. 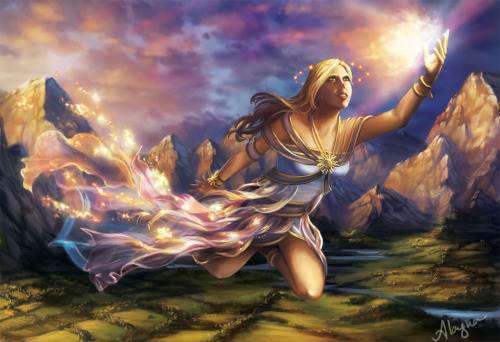 I for one, would like to see a Magic: the Gathering block with themes rooted in Greek Mythology. 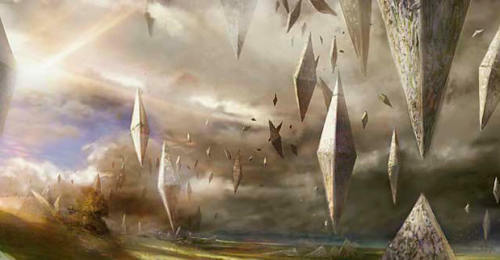 Welcome to the Plane of Zendikar - HEDRONS - frack’n everywhere ! 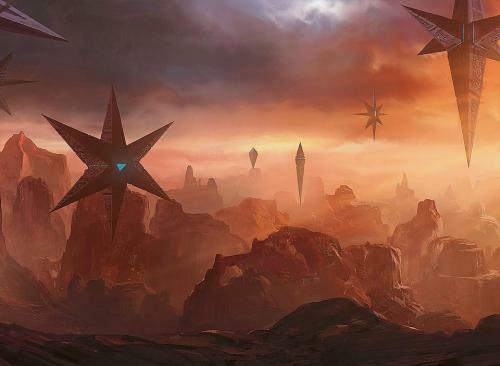 Ancient, rune-carved monoliths called hedrons are strewn across Zendikar. Up to ten miles long, some of these stones drift in the sky; others are buried in the ground, some whole, some broken. They’re remnants of a lost civilization, but their original purpose is unknown. We want to have a quick looky-loo at one of our fav colour combinations in Magic: the Gathering today - green / blue and more specifically represented by the themes in Ravnica's Simic Combine . . . Let's explore! Prime Speaker Zegana – Gatecrash mythic rare. Zegana is the speaker for Zonot One, and she delivered the Fathom Edict that declared a new beginning for the Simic Combine. She claims that the Speakers' Chamber can replace her as guildmaster at any time, although not everyone believes this. Momir Vig, Simic Visionary – Dissension rare. Momir Vig was the leader of the Simic Combine in the original Ravnica block. As an elvish bionmancer, he oversaw all the work done and determined the general direction Simic scientists took. But he also has his own work: a savage, instinct-driven being, based on cytoplastic technology. Here are two 60-card piles representative of how these two legendary guild leaders may operate. Quite decidedly, Momir shines in a creature-centric EDH / Commander format, but we'll cover that latter. For some reason, we've overlooked a few of the cards in the Momir build and will want to drop by MTG Mint Card to pick up a few MTG singles for our Momir EDH deck.